Seven years ago I met the man of my dreams – a super tall, curly haired graphic designer with a passion for music and a great sense of humour; and in April last year, he asked me if I’d like to become his wife. After crying into my steak (he popped the question over dinner at our favourite restaurant) and querying whether he was really asking me to marry him – it came so out of the blue that I really wasn’t expecting it – I said yes (a thousand times yes! 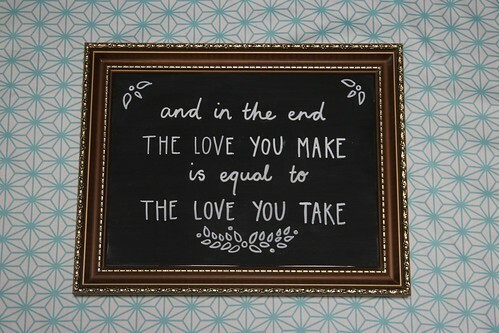 )… then immediately started planning our wedding. Sporting a beautiful vintage engagement ring on my finger, I created a Pinterest account the next day and began collecting inspiration images that helped me dream up a creative vision for the celebrations. 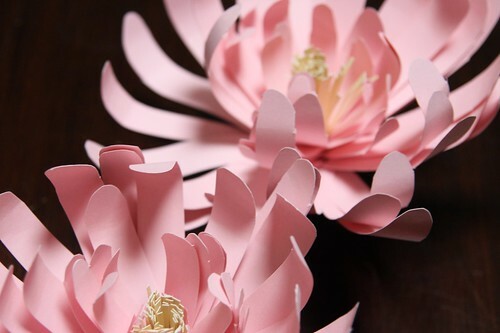 I’ve decided to take a very DIY approach to the wedding – I’m making the decorations, arranging the flowers and doing as many crafty projects at home in the lead up to the big day as I possibly can. 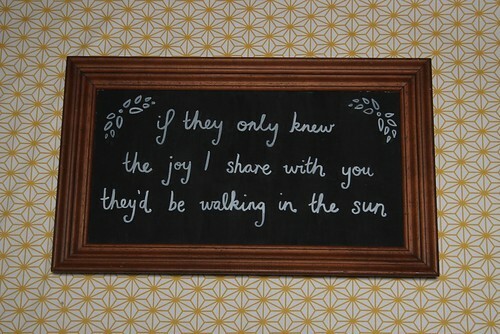 My favourite project thus far has been making these chalk boards out of old paintings. My mother-in-law to be and I op-shopped old prints and paintings with nice frames (sorry to the original artists! 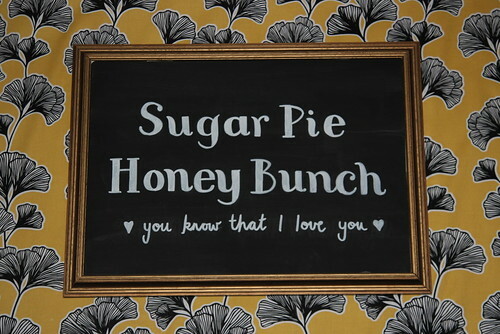 ), then I painted them with chalkboard paint and adorned them with lyrics from love songs that are of significance to Tom and I. I’m planning on putting the ‘Sugar Pie, Honey Bunch’ one on the dessert table, then hanging the others around the reception area. Oh, and in case anyone is interested, I photographed the chalk boards on top of bolts of printed fabric that I purchased from Spotlight to use as table cloths ($9.99 per metre with a Spotlight card). 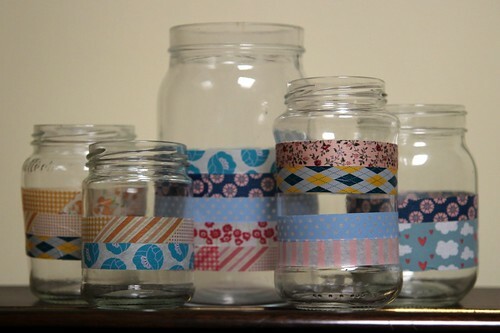 My friends and family have been super helpful with all my DIY projects, including collecting crates and crates of jars for me, which I’ve decorated with Japanese washi tape purchased from Etsy and Ebay. 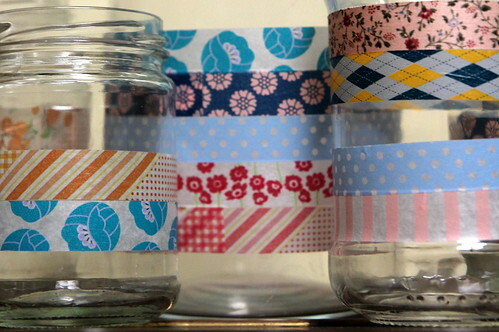 Washi tape is a super inexpensive way to transform plain glass jars into colourful vases or candle holders and is really easy to apply. I think these will look great on guests’ tables, all clumped together and full of flowers, alongside vintage vases and bottles that I’ve found at op shops. Tom and I will be married under an art deco archway at the Mt Lawley Lawn Bowls Club, which I’m going to decorate with paper flowers. I had a crafternoon with some girlfriends recently and we managed to fob our way through making these pretty pink flowers, vaguely following instructions from this Spanish blog post. 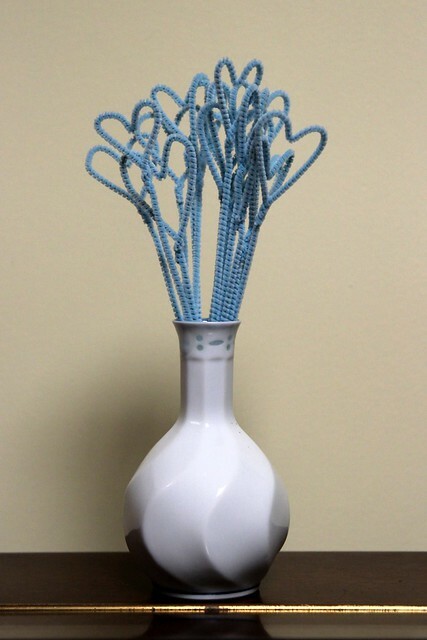 As we’re getting married at a Bowls Club there will be an abundance of grass around, so I’ve crafted these cute little blue hearts out of pipe cleaners, which I will stick into the turf near where we’re getting hitched. There are plenty of other projects that I’ve also been working on but I don’t want to give too much away just yet, so you’ll need to stay tuned for more wedding DIY fun. In the meantime, keep up with my pins via – pinterest.com/dropstitch. Squueeeeeee the fabric & flowers & jars & chalkboards look ADORABLE, it’s going to look BLOODY AMAZING. OMG I looove this song! 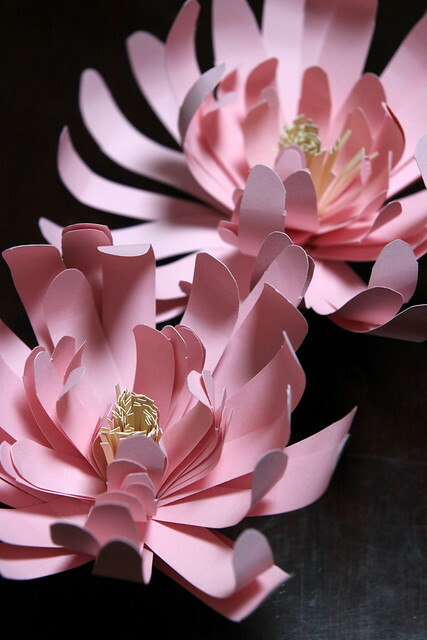 🙂 Lovely idea with paper flowers. Congratulations!